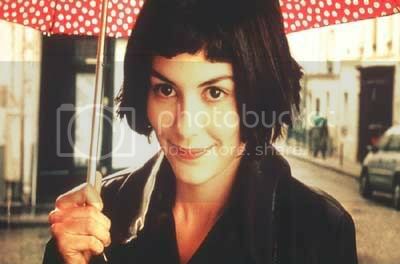 Impish Amelie (Audrey Tautou) lives alone and works in a cafe. When she finds a trove of toys hidden for 40 years behind a baseboard in her apartment, she's inspired to repatriate the items, an impulse of generousity that sparks more benevolent acts. A celebration of life, Amelie reminds us, of the small wonders that abound around us...if only we paused to look. It is a french film, with subtitles. I also loved the music by Guy Klucevsek, it was perfect for this movie! Here is a link to the trailer, photos & bio of Audrey....now go get the movie!! That is my favorite movie of all time! btw are those postcards yours? u have talent!